3 VCOs each featuring Sawtooth and Square wave. All have CV inputs for Pitch and Pulse width. 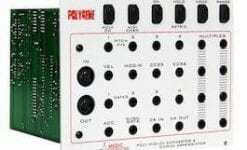 VCO 1 also has an Octave switch and Cross modulation switch (FM). VCO 2 has a Wide range switch – to make the Tune range very wide (down to LF!). It also has oscillator Sync. VCO 3 also has a Wide range switch. Also, MIDI pitch control can be disabled to make this a free running oscillator. Ideal for modulation duties. 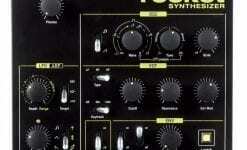 VCO 2 and 3 can both be used as LFOs. Sub oscillator, taken from VCO 3. 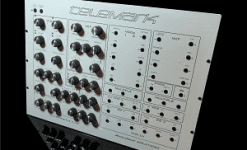 Mixer – with Mute switches and additional audio inputs. Multimode 12db filter – featuring Low pass, High pass, Band pass, and Notch filters. VCA – with EG and Thru (bypass) switch. 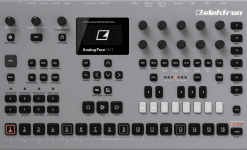 LFO – with delay (fade in) feature. 2 Envelope Generators. With Triggering options. Interval Generator. A special type of pitch transposer. You can set 6 different pitches to each of the switches, and then transpose the VCOs manually to create performances. Great when used in conjunction with the arpeggiator and / or patternator. 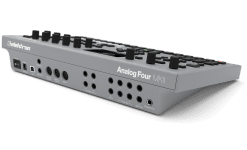 Arpeggiator – Using a MIDI keyboard program in notes to arpeggiate! The arpeggiator can also be used as a simple 16 note sequencer. 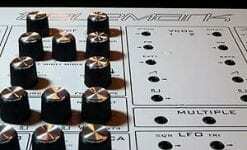 Patternator – this is a unique type of sequencer / rhythm generator. Use the 4 CV control to create melodic loops – change the the loop using the Skip and Reset switches in real time! Use the 2 Beat knobs to alter the 8 step gate / trigger pattern generator. Unique artistic case design. 5 minutes with a screwdriver and the plan can be flipped, allowing the synth to be laid flat. Real analogue hard wood sides, from a sustainable source. MIDI to CV output socket including clock. All circuits have extensive minijack input and output sockets. It can be cross-patched within its self to create an infinite range of sounds. 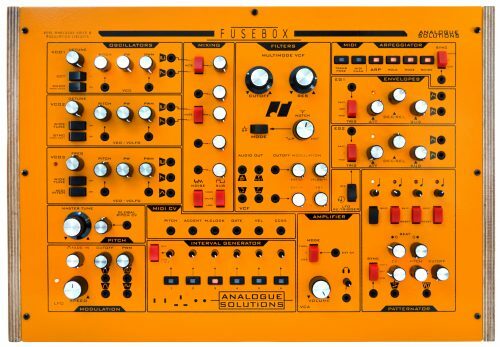 Or it can be cross patched with other synths and modulars.